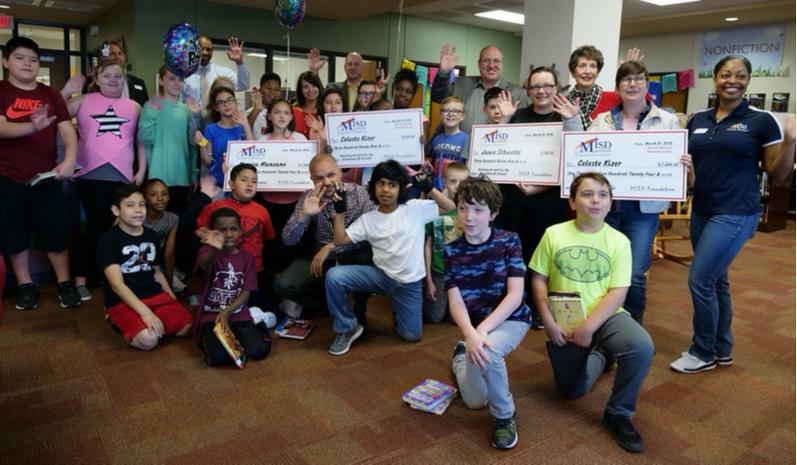 Perry won two Spring grants this week from the MISD Education Foundation with much excitement in our library. Janie Schuette and Celeste Kizer won a grant "Building on with Eye Spy Ecosystems All Around" for $399.90 from the Vernon Newsom Memorial Grant. Mrs. Schuette and Mrs. Kizer want to add plants for a Sensory Garden containing herbs with scents like lavender/ rosemary, plants with tactile textures like lamb’s ear, vegetables, and fruit and to release Painted Lady butterflies this Spring. They want to share with our students hands on learning experiences, which are essential for exploration of an educational objective like ecosystems. Monica Manzano and Celeste Kizer won a grant "Get write to the Context" for $1,524.00 from the Vernon Newsom Memorial Grant. Mrs. Manzano and Mrs. Kizer want to purchase 6 Chromebooks for a mobile Writing Station. They want our students to learn to use language in real context to help them develop skills necessary to become fluent readers and writers by creating newspapers (individual, class, GT, school, etc.) for project based learning by encouraging them to read and write more.